The opening scenes in Shazam are compelling and well presented. Two boys are featured, one who will become Dr. Thaddeus Sivana (Mark Strong) is not respected by his older brother and his father has little patience with him. Following a car accident he finds himself in a snow covered location that leads to a cave in which he is introduced to The Wizard (Djimon Hounsou) and the seven negative sins represented by gray monsters. The other boy finds himself lost at a carnival he is attending with his mother when he chases a trinket he has just won at a game. He doesn’t finds his mother. Later he is in the Wizard’s cave and learns he may be the one person who can bring back the goodness the Wizard represents by destroying the monsters. 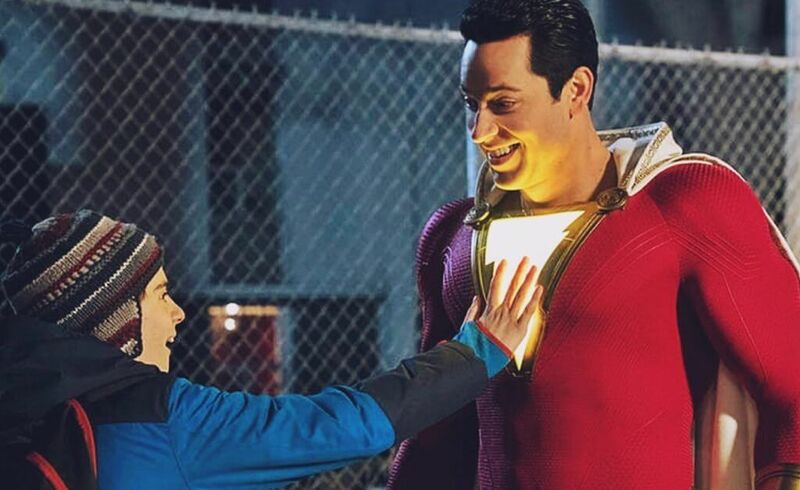 Asher Angel is the boy and Zachary Levi is the big Shazam. Billy the kid, finds himself in a foster home after we see him wandering around caring for himself on the streets. Rather than spend the script on battles with the dark forces, (he does take on the evil Dr. Sivana late in the film) we find that Billy and his friend Freddy (Jack Dylan Grazer) interact like the two characters in Big. They even find themselves dancing on a large key board in a toy store. The interaction with the kids in the foster home are at the heart of the story and the battle scenes are restrained. Each kid brings factors to the Shazam and each becomes a power by the end of the film. All the kids survive in the well managed home filled with affection and love. They are all impressive but Faithe Herman playing the little girl seals every scene she is in. She is a joy to watch. Even with quality special effects the best part of the film is the heart warming relationships the kids develop and the effective performance by Levi. Shazam, is delightful and satisfying to watch. MPAA Rating: Rated PG-13 for intense sequences of action, language, and suggestive material.